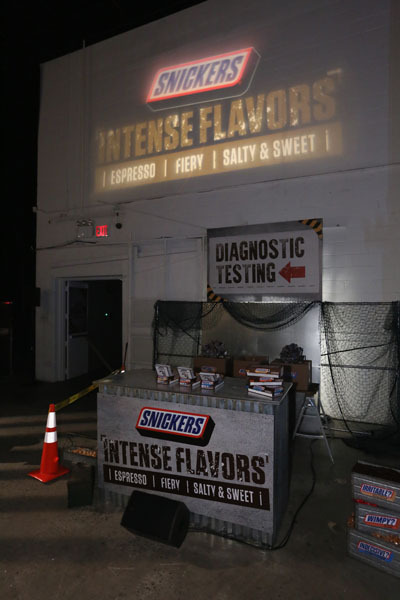 SNICKERS® is putting hunger to the test with an intense, interactive bunker simulation that features ‘escape room-style’ challenges related to each of SNICKERS® three new Intense Flavors – Espresso, Fiery, and Salty & Sweet. 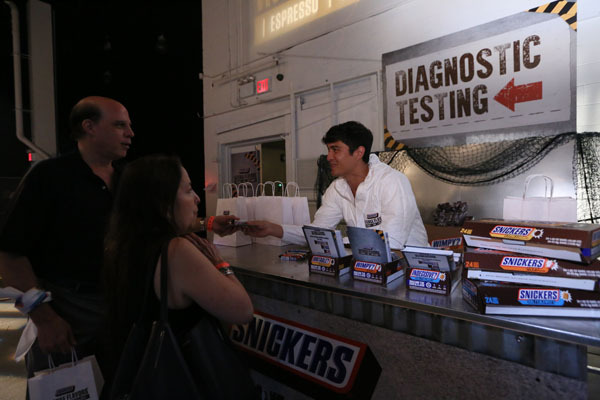 Fans are invited to the SNICKERS® Intense Flavors ‘Hunger Bunker’ Pop-up Event where fans will have a limited amount of time to complete each flavor challenge and at the end of the simulation, they will receive a Flavor Diagnosis, ultimately identifying which flavor they need to survive intense hunger. 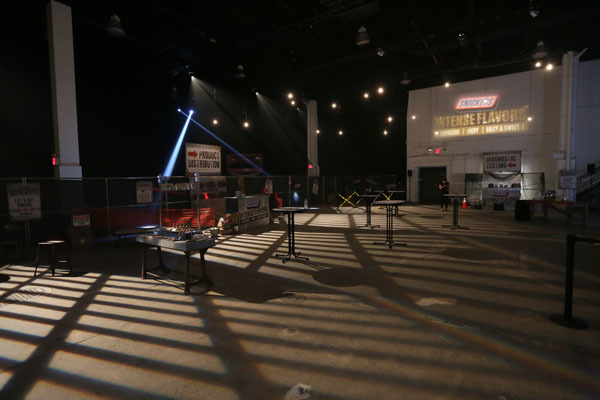 While fans will need to sign up to participate in the bunker via www.SNICKERSHungerBunker.com, there is a free interactive sampling lounge open to the public. Bunker simulation spaces are limited and only available on a firstcome, first-serve basis via the sign-up link: www.SNICKERSHungerBunker.com, however no reservation is needed to enjoy the free interactive sampling lounge open to the public. All are welcome. Parent or guardian must accompany children 12 and under. • When the bunker’s oxygen supply is running low, you’ll have to withstand some intense IRRITABLE situations as you race against the clock and put air pipes back in order before you run out of air – if you can. • When disaster strikes, your team will have to decide and weigh some real moral dilemmas. We’ll put your decisiveness to the test as you make tough decisions on each question before the timer runs out. Don’t be INDECISIVE. 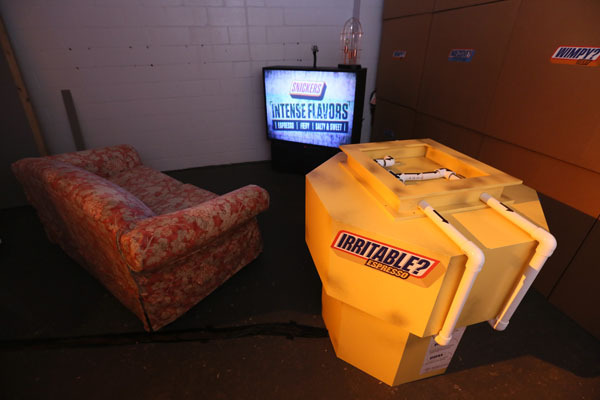 • The bunker’s heating system is damaged, and you have to reach into some scary, slimy, strange places to repair it. Don’t be WIMPY: dig deep to repair the heating in time. twist – espresso, chili pepper or salt-infused. 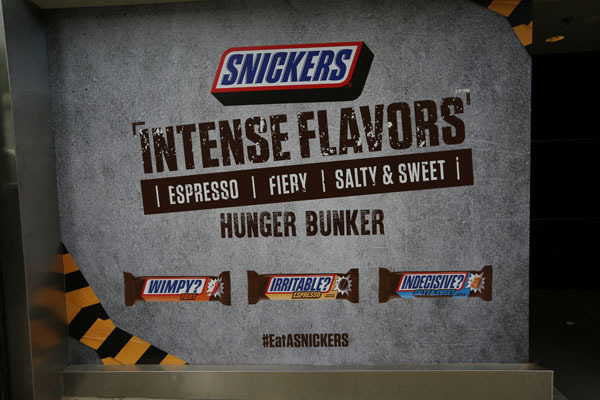 The new flavors will join the brand’s popular, “You’re Not You When You’re Hungry” campaign, with the new SNICKERS® Intense Flavors corresponding to the hunger symptom on the outside of the packaging but n ow with flavor-infused traits: Irritable = Espresso, Wimpy = Fiery, and Indecisive = Salty & Sweet. We encourage fans to visit their favorite retail store and share their reactions to the new SNICKERS® Intense Flavors on social using #EatASNICKERS. Fans can also visit SNICKERS® on Facebook (Facebook.com/SNICKERS), Twitter (Twitter.com/SNICKERS), Instagram (Instagram.com/SNICKERS) or at www.SNICKERS.com for more information on ways to participate. For more information about SNICKERS® Intense Flavors product images and/or samples of the three new flavors please contact: Stephanie O’Brien at SOBrien@webershandwick.com.